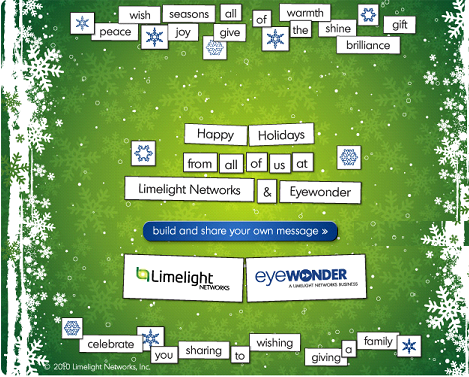 Happy Holidays from Limelight Networks and EyeWonder! I updated MySQL to 5.5.8 on this box and recompiled PHP 5.3.4 against it. Everything is now updated. Good point, assuming keep 90k doesn’t turn into keep 80k (which would demonstrate the liberal assumption). However, most of the outrage is about business execs., entertainers, etc. who make millions/year. It is unfortunate that the small-business owner gets caught in this category (collateral damage). You let the tax cuts expire, you lose some jobs; you make the tax cuts permanent, you add $700bn to the deficit (which we can’t afford). Damned if you do, damned if you don’t. The problem is that most of the people in the category (and the vast majority of the $70 billion per year) ARE business owners — there isn’t that many millionaire/billionaire executives, entertainers compared to millionare/billionare business owners. All non-corporate small businesses with more than $200,000 in annual revenue ($250,000 for married owners) would be subject to higher taxes meaning less new jobs overall. Also, for non-business owner millionaire and billionaires, they’d be investing that money into tax-deferred investments, which would also result in lower tax revenue. Look at tax revenues before and after tax decreases during all of their administrations. Notice how tax revenue went up after the tax decrease, thus lowering the deficit. Only the CBO has been able to predict a revenue increase, and the CBO is legally forbidden from assuming behavior changes, even though common sense states that behavior does change. Also, look at break down by income earner. After tax decreases for the rich, notice how the rich actually end up paying a higher percentage of the taxes! How is this so? When taxes are lower, and you have a lot of money, you tend to invest more of it into riskier investments that result in higher returns (to get even richer). You get rewarded with higher returns. The government then taxes those returns, but you still get a higher overall return. Now when the taxes go up, you shift to tax-free investments, which are safer. But because taxes are free on these investments, they have a higher overall return than the riskier investment with the higher taxes. Further proof: look at Canada. Their current GST is 5%. A few years ago, it was 7%. When they lowered the tax rate to 6% and then to 5%, both times, they saw HIGHER revenue. Why? People spent more, so more money was subject to tax. By rewarding spending and investment, you get more spending and investment, which results in higher overall tax revenue. Remember, the Congressional Budget Office has to assume that people will not change behavior as a result of tax changes (i.e., fire or hire employees), when people obviously will. My guess is that raising the taxes will result in LOWER tax revenue, not higher (seeing as when the rates went into effect in 2001, it resulted in HIGHER tax revenue). Remaining: $20,000 (which means he increases his take home pay to $110,000 and can then blame it on Obama when he fires that 4th employee). Because he fired that employee, the government will now make less in taxes than they got. or Employees Hired: 4 at a reduced total package of $27,500. This might mean he doesn’t pay for their health insurance, or reduces their pay outright. This is simplistic example, but it works. Basically, you won’t be taking the money from the rich. They’ll figure out a way to keep the same amount of take-home pay. Based on the liberal assumption that rich people are just greedy (the reasoning for increasing their tax rate is to make it more ‘fair’), then you also can assume that they’d rather just fire an employee or cut pay based on an increase in their taxes so as not result in a lower take home pay.